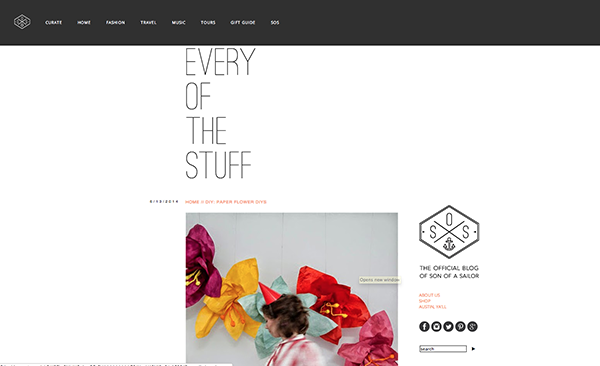 EVERY OF THE STUFF: Introducing our new blog: Every of the Stuff! 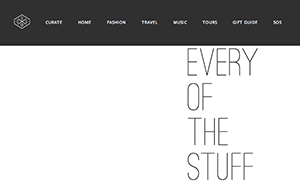 Introducing our new blog: Every of the Stuff! Bah duh duh duh bah BAH! That, dear readers, is the horn announcing the debut of our new blog, Every of the Stuff! For the last week or so, you may have noticed sonofasailorblog.tumblr.com routed you to another domain. After a few months of redesign work (a million thanks to Kirsten! ), we present to you Son of a Sailor's fancy new blog. We're way excited to have a new and improved blog as part of our growing presence as a more encompassing lifestyle brand. There are several features to dress it up and provide YOU, our very important reader, with a more engaging, user-friendly experience. Before we tell you about those features, you're likely wondering what in the world Every of the Stuff means. It is a derivative of the phrase "all of the things," a phrase made popular by the television show "Girls" and by the Internet. All of the Things was the original name of Son of a Sailor's blog. When we were searching for that phrase as a domain name, it was already taken by another blogger. So what similar suggestions did GoDaddy give us? Inexplicably, it gave us the VERY hilariously nonsensical phrase, Every of the Stuff. And we'll never go "all of the things" again. Increased searchability: Our readers can now search by category and by post. Similar recommendations: After reading a new post, you can now see posts similar to the one you read. If you're on a home decor tear after reading a post featuring DIYs, posts on the same topic will show up in the bar underneath that post. Toolbar: Our categories are now clearly displayed AND searchable thanks to the sleek new toolbar spanning the top of the page. Popular Posts: On the right side of the page, underneath our Instagram widget, you can now see our most popular posts. This also helps us see which topics are piquing your interest more than others. Added social media features: Now you can see what Son of a Sailor is up to on Instagram! You can also access our other social media platforms - being BFFs with us has never been easier. Thanks so much for being loyal readers! We're excited to see how our 'lil blog baby continues to grow as we have more shop tours, maker interviews + more. Now it's your turn: we want to hear your feedback! What do you like about the new layout? What annoys you TERRIBLY? What posts do you want to see more of? Share it with 'yo friends, leave us comments, send us feedback. It's not just about what we like, it's what YOU like to!